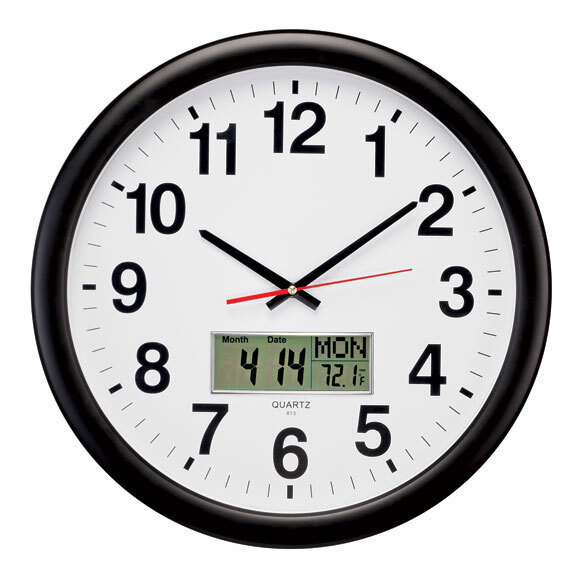 Giant, wall-mounted analog clock features a second hand and large numbers that are easy to read from anywhere in your home. Additional LCD display shows date, day of the week and indoor temperature. Requires 2 AA batteries (not included). 2 1/2" D x 17" dia. Metal/plastic. The first clock arrived broken. Exchanged. The second clock arrived broken. Exchanged The third clock has not arrived yet. Clock is over priced. cheaply made. Was looking for a clock big enough for my elderly Mom to see the time, day and date. I am hoping third time is a charm and it will work. If not I will return the third exchanged clock for a refund. This product arrived broken I returned for a full refund because it is very cheaply made and was not worth even the discounted price. Need easy-to-read wall clock with strong contact. For my dwindling memory and eyesight! Needed a new wall clock and I like all the features. We needed a clock that would give us all the information at once. We are in an assisted living facility and had to get our own clock for our room. Size was bigger than average. The clock provided time, date and temperature and also is battery powered rather than requiring a power cord. This clock is easy to see from a distance. We also own a wood stove , so quickly reading the temp on the clock has made it easy to monitor the temp in other rooms. It hung in our kitchen and displayed the date and day so we knew even before we had our morning coffee or checked our phones. This is our second clock. The first fell off the wall during some renovation and was destroyed. We have since realized its the best clock ever! Mother-in-law has macular degeneration and cannot see standard size clocks. Because when you retire, it's hard to keep an instant recall of day and month. I like the size and look of the clock. It also has the benefit of the day of the week, the actual date and also shows the temp - which all 3 are added bonuses! I don't see well anymore. Neither does my brother, so I bought one for him, too. looking for some type of clock for seeing impaired? BEST ANSWER: Thank you for your question. This clock does have giant numbers to assist with the seeing impaired. We hope this information will be of help to you. does the giant wall clock glow in the dark? BEST ANSWER: Thank you for your question. Unfortunately the clock does glow in the dark. We hope this information will be of help to you.